Wilhelm Schacht was Director of the Munchen-Nymphenburg Botanical Gardens. Previously he had been Director of the Royal Parks and Gardens in Bulgaria, and in the company of King Boris III of Bulgaria made numerous botanical expeditions in the Alps and Balkans. He is credited with the discovery and classification of many previously unknown perennial species. While he was director of the Royal Botanic Gardens in Bulgaria, Wilhelm Schacht was walking with King Boris III of Bulgaria on Mount Musala in the Rila mountains, he found a natural Geum hybrid, which he then named G. x borisii after his companion and employer, King Boris III of Bulgaria. Geum coccineum ‘Borisii-Strain’, often marketed as ‘Tango’, ‘Queen of Orange’ and ‘Cooky’ is an early flowering variety, with single, overlapping, orange-red petals and orange-yellow stamens. Many gardeners look for easy to grow, reliable perennials that provide a bright, cheerful display of colour early in the season. Geum coccineum ‘Borisii-Strain’ flowers the first year from seed producing wonderful vivid orange-red toned flowers from late spring into summer on short 40cm (16in) stems. With attractive evergreen mounds of mid-green lobed leaves, the plants have a compact growing habit, which makes it well suited for the front of the border, rock garden or in containers. Fully hardy, Geum needs little maintenance. In the garden they are resistant to rabbit and deer feeding and attract butterflies to the gardens. The plants perform best when grown in moist, well-drained soil and can be grown in full sun or in partial shade. Its foliage looks good year round in temperate areas. Flowering May to July they will often rebloom in September to October. This easy and reliable perennial is commonly used for beds and borders. It can be used under trees or near wooded areas and can be planted in containers or used as cut flowers. Sow at 18 to 22°C (65 to 70°F) in a well drained compost mix. Cover with vermiculite. Water from the base of the tray, keeping the compost moist but not wet at all times. Germination should occur in 21 to 28 days but is occasionally a little longer. Prick out each seedling once it has its first set of true leaves, transplant into 7.5cm (3in) pots or trays containing a peaty soil. Grow on under glass. Gradually acclimatise to outdoor conditions for 10 to 15 days before planting out in spring. Plant 40cm (15in) apart. Geums tend to have a mound of foliage and flowers either on spikes or just above the foliage so place them at the front of the border. The colours are to some extent all on the warm side of the colour wheel so they associate well with other warm and hot colours. Geums like a fertile soil enriched with well-rotted organic matter which won't dry out too much in summer. Position in either full sun or light shade suits them. Most Geums first flush of flower is late spring to early summer. Keep well watered and deadhead by removing the spent flower stems at their base. This encourages more flower production. Geums will remain evergreen through winter but the old leaves become brown by the end of winter and make the plants look scruffy. You can give the plants a good haircut in late winter or pull off old leaves. They are tolerant of pests and diseases and only need to be staked in very exposed conditions. In very dry conditions some Geums may be slightly affected by powdery mildew. If it bothers you cut off all the mature leaves keeping the small, new ones starting to grow from the base. Congested colonies can be lifted and divided every three years to maintain flower vigour, otherwise the middle becomes exposed and the plant declines and dies out. If divided regularly they perform for years. The easiest time to divide is in early autumn. Break off pieces and replant or pot up, but do not let divisions dry out. Division can also be done in spring. Ground cover, Borders and Beds, Shaded areas. There are about fifty species in the genus Geum, and they are all herbaceous perennials. They places of origin are widely scattered: in Europe, the Americas, New Zealand, Asia, and Africa. The plants inhabit a wide range of places such as dry open fields, bog and alpine regions. Geum Cooky is a hybrid variety that comes true from seed, something that many geums do not do. The genus name geum comes from the Greek geuo and means ‘to give flavour or relish’. Since Roman times the plant has been used for flavouring food and drink. The species name ‘coccineum’ is derived from the Latin coccineus’ meaning 'scarlet-coloured' and refers to the colour of the flower (as in the 'cochineal' beetle – used for its red dye). It is commonly referred to as the Scarlet Avens. The common name of Avens derives from Middle English avence, from Old French, from Medieval Latin avencia. 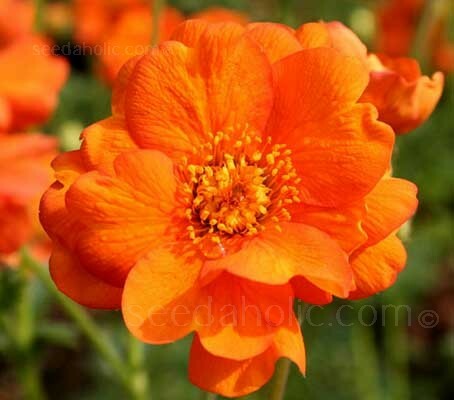 The meaning of which is unclear but it is thought to refer to Geum urbanum as 'a kind of clover'. Sue Martin holds the National Collection of Geum, of which there are over a hundred different cultivars, hybrids, varieties and species. The garden, at Cranbook in Kent is open on selective days in May. If you would like to visit please telephone first - 0044 (0)1580 852425.